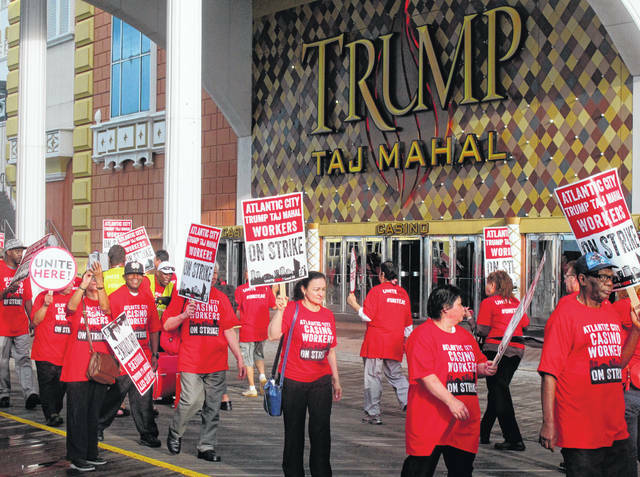 In this July 1, 2016, photo, members of Local 54 of the Unite Here casino workers union picket outside the Trump Taj Mahal casino in Atlantic City N.J. shortly after going on strike against the casino, which was owned by billionaire investor Carl Icahn. On Wednesday, April 10, 2019, the union called on casino regulators in New Jersey, Nevada and Ohio to protect casino workers from hedge fund or private equity firms that own casinos if they seek to quickly extract profits from the properties while hurting workers. Bob McDevitt, president of the union’s Local 54 in Atlantic City, said private equity ownership has been disastrous for his city’s casino industry, with shutdowns and job losses attributable to the firms’ pursuit of short-term profits. He cited private equity ownership components of Caesars Entertainment, which owns the Caesars, Harrah’s and Bally’s casinos in Atlantic City, and MGM Resorts International, which owns the Borgata. Under the control of Apollo Global Management and TPG Capital following a leveraged buyout in 2008, McDevitt said Caesars was left a “disastrous level of debt” that ended in the casino company’s bankruptcy. “I’m still waiting for a single coat of new paint at Bally’s,” McDevitt said. McDevitt said state casino regulators have the power — and the responsibility — to keep employees in mind when approving ownership or management change requests made by the casinos’ corporate owners. He cited the case of the Tropicana, whose former owner was stripped of his casino license in 2017 after letting the property deteriorate while drastically cutting investment in it. “We will do our due diligence on all these applications as they come forward,” he said.